Our 2013 Chairman’s Council trip began on March 3rd, with a convivial cocktail reception at Ruth Robinson’s flat in London. Old friends and new shared a lovely evening thanks to our gracious hostess. All the members at the British Library visit. The morning began with a welcome meeting and refreshments hosted by Sarah Frankland, Development Head, and Abby Wilson, Patrons and Planned Giving Manager. Dr. Malini Roy, co-curator, led us through Mughal India: Art, Culture and Empire, the collection of bejeweled and golden objects, as well as beautifully illustrated manuscripts from the Library’s Central and South Asian collections. Following the tour, Peter Barber, Head of Cartographic and Topographic Manuscripts, introduced three volumes given to the ATBL by Roger Baskes and lent to the British Library. Lunch in the Boardroom followed, where speakers included Chairman Baroness Blackstone, speaking about the importance of the internship program in sharing skills and resources with the greater community; CEO Roly Keating, highlighting the amazing diversity of staff, collections and visitors, and his conviction that diversity provides a worthy foundation for the Library’s bright future; Sarah Frankland, Head of Development, speaking about the endowment and encouraging members to provide feedback as well as support; and Dr. Scot McKendrick, Head of Western Manuscripts, discussing the challenges and progress made in digitizing the extensive BL collections. Lunchtime conversation was further enlivened by the presence of Caroline Brazier, Director of Scholarship and Collections, who spoke about future exhibitions, along with Peter Barber and Susan Whitfield, Director, International Dunhuang Project, a collection of Central Asian manuscripts. The afternoon progressed with a demonstration by Alex Whitfield, Learning and Digital Program Manager, of “English Online,” which features 20 authors and 50 texts. Then there was a presentation by Claire Breay, Head Curator of Medieval and Earlier Manuscripts, about the Magna Carta, which will be featured in an historic BL exhibition scheduled for 2015. The afternoon concluded with an exciting, eclectic, “Show and Tell” of collections items by Nicolas Bell, Lead Curator of Western Music; and Tim Pye, Curator of Printed Literary Sources. 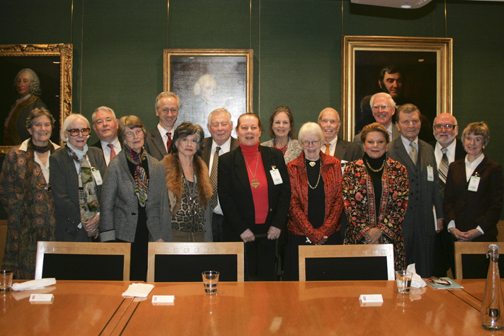 That evening ATBL members were invited to attend the Friends of the British Library’s (FBL) Annual Meeting with speaker Roly Keating and host Christopher Wright, Deputy Chairman, FBL. A busy Monday drew to a satisfying close with the FBL’s Annual Lecture, featuring Dame Penelope Lively DBE, the Booker Prize winning author of fifty books for both children and adults. Dame Lively’s humor and rich life experiences were evident in her charming lecture, “Reading and Writing: My Life in Books.” A reception followed. On Tuesday members arrived at Hampton Court Palace for a sumptuous Henry VIII-style lunch with Chris Martin, Head of Hampton Court Palace, and Tracy Borman, Chief Interim Curator at Historic Royal Palaces. Lunch was served in the “Banqueting House” (photo above), a small outbuilding that is said to be where King William III “entertained” a mistress or two. 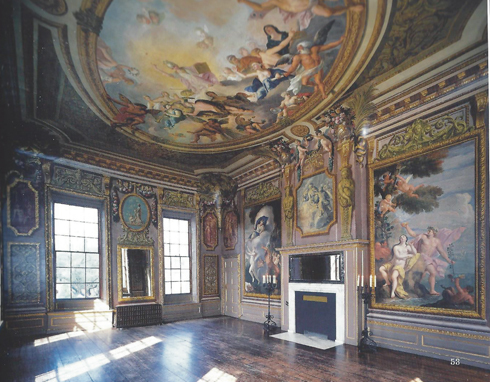 The exquisite chamber is decorated by Antonio Verrio’s vibrant and sensuous murals depicting the lives of the gods. Lunch was followed by a private tour of the Palace, including privileged access to the rooftops (photos above). It is only from this vantage point that you can fully appreciate the scope and elegance of the 750 acres of buildings, waterways and gardens. Our visit to Hampton Court concluded with a brief tour of Henry VIII’s Grand Hall and the quintessentially Tudor Chapel Royal. The view from the private service stairs was spectacular. That evening a fragrant and delicious Persian buffet awaited us in Twickenham, at the home of gracious hosts, Fereydoun and Yekta Ala. Fereydoun’s grandfather had served as regent to the Shah, and his father followed as Prime Minister and then Ambassador to the US. Yetka told us of her husband’s harrowing escapes from persecution and described their many charitable efforts in Iran. 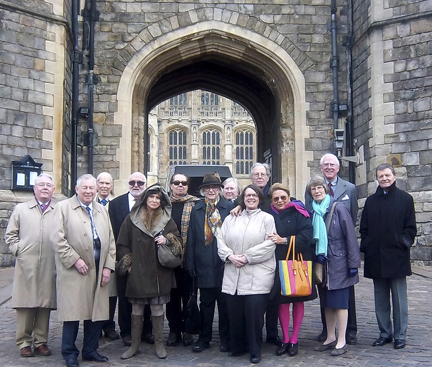 This much anticipated tour of Windsor Castle was the “jewel in the crown” of a trip already rich with visual and intellectual pleasures commencing in the Royal Library with Jane Lady Roberts, Royal Librarian, and her staff. Lunch was at the nearby Tower Bar & Brasserie in The Harte & Garter Hotel. The classic British cuisine, was enjoyed by all and it was a happy group that returned for the afternoon. Windsor Castle was everything we imagined and more, with highlights too numerous to detail here, but Queen Mary’s Dollhouse and the Royal collection’s exhibition, “The Queen: Portraits of a Monarch” are treasures beyond compare. Queen Elizabeth II has been painted and photographed by some of the most talented painters and photographers of our times. The exhibit, “The Queen: Portraits of a Monarch,” contained many of these images brought together for this historic exhibit. The most recently acquired work (2012) is a series of four large screen prints by Andy Warhol. Other artists represented included Lucien Freud, Cecil Beaton and Annie Leibowitz. No matter the artist, it was the Queen, who stole the show. At supper on the return coach, all agreed that there could not have been a more fitting finale to our 2013 trip than our day at Windsor Castle (below).